UHPL offers Automated Conveyor Bin Cleaning & Drying Machine with latest technology to clean Bin / Crates/ Trays. This machine designed for high volume of productivity with minimum floor space & power requirement. 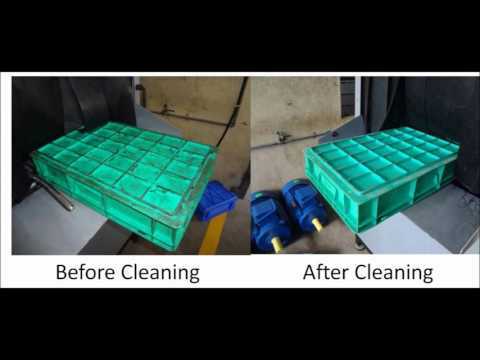 It is also called as Bin Cleaning Machine / Tray Cleaning Machine / Crates Cleaning Machine. Complete cleaning inside & outside of Bins. Custom made machine for specifically designed for various sizes of Bins. Low liquid Level Protection with machine Operation. On line Filtration system for Better Cleaning. 100 to 200 trays per Hour. No diesel or thinner wastage. Cleaning cost per bin is minimized. Customer gets satisfied through the cleanliness level.